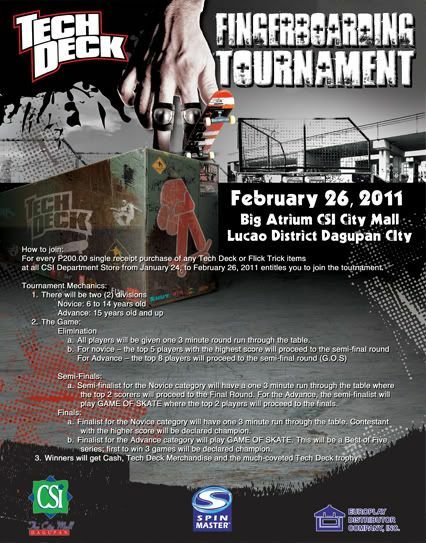 For every P200.00 single receipt purchase of any Tech Deck or Flick Trick items at all CSI Department Store from January 24, to February 26, 2011 entitles you to join the tournament. a.All players will be given one 3 minute round run through the table. a.Semi-finalist for the Novice category will have a one 3 minute run through the table where the top 2 scorers will proceed to the Final Round. For the Advance, the semi-finalist will play GAME OF SKATE where the top 2 players will proceed to the finals. a.Finalist for the Novice category will have one 3 minute run through the table. Contestant with the higher score will be declared champion. b.Finalist for the Advance category will play GAME OF SKATE. This will be a Best of Five series; first to win 3 games will be declared champion. 3.Winners will get Cash, Tech Deck Merchandise and the much-coveted Tech Deck trophy. pano ang point system sa park run?